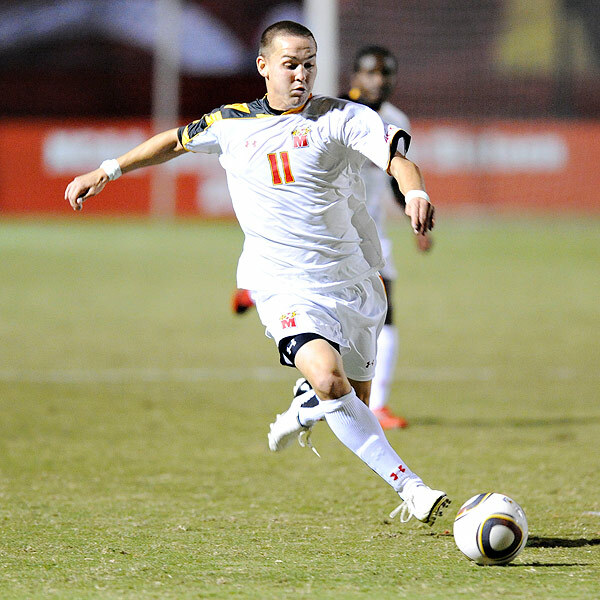 Everything had fallen into place for Maryland men’s soccer coming into their match Tuesday at in-state opponent UMBC. The Terrapins had throttled Stanford, Radford and No.8 Boston College by a combined score of 10-1 the previous week. During that three-game stretch, the Terps allowed only one shot on goal while they had four different players score at least once. And with then-No. 1 North Carolina losing in double overtime to Virginia Tech, Maryland was voted as the top-ranked team in the country. All of the Terps’ good fortune almost came to a screeching half against an upset-minded and experienced UMBC squad. The Retrievers were able to hold the Terrapins off the scoreboard in the first half, the first time since Maryland’s victory over West Virginia in the second game of the season that the Terps did not net a first-half goal. However, Maryland came out firing after halftime. Casey Townsend (46th minute) scored his sixth goal of the year just 23 seconds into the second half on a pass from Sunny Jane to give the Terps a 1-0 lead. However, like they would for the rest of the night, UMBC would have an answer. Just six minutes later, Pete Caringi notted things up at one. 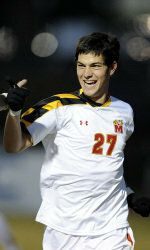 Townsend (7- 57th) responded with a goal off a corner kick to give Maryland the lead again. In the 81st minute, Townsend (8) scored his third goal of the game for his second-career hat trick. With only about 10 minutes to play, Maryland owned what looked to be an insurmountable lead with the way the Terps defense had been playing all season long. However, the Retrievers, who had scored only two goals all season long prior to this match, were able to answer once more and stormed back as defender Sean Rothe scored in both the 83rd and 84th minutes to tie things up. The stunned Terrapins would take things to overtime. At the very end of the first overtime, Maryland was offered a perfect chance to end the game and go back to College Park with a victory. John Stertzer, who had previously knocked home a penalty kick against West Virginia two weeks ago, teed up the ball for a PK after forward Patrick Mullins was fouled inside the box. Stertzer missed the kick, but was able to make up for it later. In the 104th minute, Stertzer (4) headed in the game-winner off a cross from Taylor Kemp to give Maryland a hard-fought 4-3 victory in a game in which not much went their way. The Terps improved to 6-0-0 for the first time since 2003. The Wolfpack have already played two top-ten teams this season. They beat then No. 9 SMU 1-0 in overtime in the Duke/Nike Classic before losing to No. 8 UC Santa Barbara 1-0. NC State has outscored its opponents 4-2 this year. Ollie Kelly leads the team with two goals on the season. The Wolfpack boast a strong defense. Goalkeeper Fabian Otte has posted two shutouts this year and has made 14 saves to go along with his 0.36 goals against average. Maryland beat NC State 3-1 last year in College Park. The Terrapins are 44-20-6 all-time against the Wolfpack. After a two-goal effort against No. 8 Boston College, sophomore forward Patrick Mullins was named as the ACC Co-Player of the Week. Mullins is second on the Terps with five goals and is tied with Stertzer with 11 points, which is tied for second-most on the club. Casey Townsend posted his second-career hat trick Tuesday against UMBC, giving him a team-leading eight goals and 16 points on the year. The senior forward had nine goals all of last season. Maryland has outscored its opponents 20-5 this season. Stertzer is third on the team with four goals. Redshirt senior Will Swaim has started every game in goal for the Terps. He has posted three shutouts and a 0.81 goals against average. 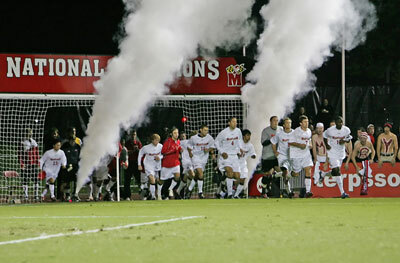 Maryland has averaged 4,732 fans per game at Ludwig Field in four matches this season. You can listen to the action live on WMUC Sports at 7:20. Luke Jackson and Steve Goldstein will be on the call. This entry was posted on September 16, 2011 by Scott Kornberg. It was filed under Maryland Terrapins, Soccer and was tagged with Casey Townsend, Fabian Otte, John Stertzer, Ludwig Field, Maryland soccer, Maryland Terps, Maryland Terps soccer, Maryland Terrapins, Maryland Terrapins soccer, NC State, NC State soccer, NC State Wolfpack, NC State Wolfpack soccer, North Carolina State, North Carolina State soccer, North Carolina State Wolfpack, North Carolina State Wolfpack soccer, Ollie Kelly, Patrick Mullins, Sasho Cirovski, Scott Kornberg, Sunny Jane, Taylor Kemp, Terps, Terps soccer, Terrapins soccer, UMBC, UMBC Retrievers, UMBC Retrievers soccer, UMBC soccer, Will Swaim.